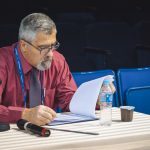 If the Championships in Khanty-Mansiysk ended right now, the medal score would look as follows: Russia – 3 gold, 3 silver, and 1 bronze medal, Armenia – 2+1+1, and China – 1+0+1. Six championships bring six different and thrilling plots. There are no primary and secondary events in Khanty-Mansiysk, however the most attention is naturally paid to the elder categories. A free day of the FIDE World Youth U14, U16, U18 Championships 2016 will become memorable for visiting Archaeopark and its huge bronze statues of mammoths, still there are those who were impressed by other, real “mammoths”! 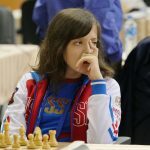 The first five rounds of the FIDE World Youth U14, U16, U18 Championships 2016 are now history, it means that there’s time to take a break and have some rest. 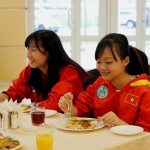 Any parent who sends an offspring for a long trip abroad, is first and foremost worried about the child’s diet at the destination. 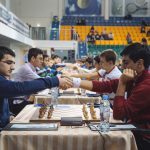 Well, the organizers from Khanty-Mansiysk probably created a new problem for the parents of the World Youth Championship participants – the players could demand a different menu upon returning home! 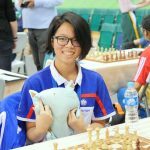 The main favorites in nearly all categories of the FIDE World Youth Championships made strong steps forward, which may even be called decisive later on. 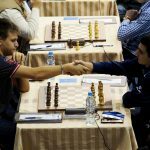 Although chess is considered a rational sport, sometimes even famous grandmasters have superstitions or follow certain rituals. Some believe in lucky pen, shirt, or shoes, others stop shaving during the tournaments, like hockey players during play-offs. Finally! The key clashes took place today in two age groups out of six. The Girls 18 category featured the most fierce and uncompromising battles between all the main contenders. The nearby boards also added some heat.